Another Yayoi Kusama Installation Has Arrived in L.A.
Maris Hutchinson. © YAYOI KUSAMA. Courtesy David Zwirner, New York; Ota Fine Arts, Tokyo/Singapore/Shanghai; Victoria Miro, London/Venice. In a matter of a few frustrating minutes last fall, 50,000 people scrambled to get their hands on tickets to see Japanese artist Yayoi Kusama’s traveling exhibit Infinity Mirrors at the Broad. Demand to get into the exhibit’s six immersive rooms was so intense that the museum extended the exhibit’s hours and increased the number of people allowed to attend at once so it could release 40,000 more tickets, which were scooped up just about as fast a few weeks later. Since that exhibit closed back in January, people who didn’t get tickets have had the opportunity to check out Kusama’s The Souls of Millions of Light Years Away, which has been part of the Broad’s permanent collection since the museum opened, as well as a second mirrored infinity chamber the Broad acquired in March. Now there’s another highly immersive (and, yeah, supremely Instagrammable) Kusama work on the scene. 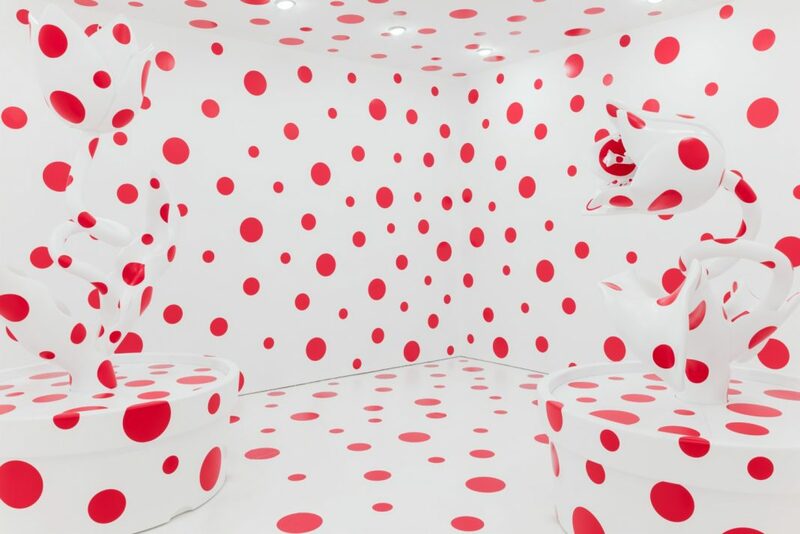 Marciano Art Foundation announced today that it has acquired With All My Love For The Tulips, I Pray Forever (2011), a sculptural installation that features large, polka-dotted potted tulips in a room in which the walls, floor, and ceiling have been covered in the same signature red polka dots. The installation will be on view in the third-floor gallery by the elevator bank, starting tomorrow, Thursday, July 26, through spring 2019. Open Thursday through Sunday, MAF is free to visit with a timed ticket reservation, and at the moment, it looks like there are plenty of tickets available for this week and the coming weeks. Bonus: Olafur Eliasson’s Reality Projector is still on display, and on Saturday and Sunday, July 28 and 29, Jmy James Kidd and the Sunland Dancers are doing a site-specific performance inside the Icelandic-Danish artist’s light installation.